It’s a reorganize-the-freezer-to-make-this-thing-sit-level-overnight cake. It’s, let me just say, a totally-worth-it cake. I made this for my sister Erin’s birthday. She was having a low key party at her place, and I offered to bring a dessert. When I asked her what she wanted, she gave me carte blanche. When left to my own devices, I have a tendency to go overboard when I’m making something for someone else. My ambition sometimes overmatches my time and basic sense of reason. It probably says something about me that when I scanned the recipe and saw instructions that said “at least two days ahead of time” I thought, “that seems reasonable.” Really with this cake, I was showing restraint. This comes from Joanne Chang’s second cookbook, Flour, Too (her first one is, not surprisingly, named Flour). Both of her books are named for and feature recipes from her Boston cafe and bakery, Flour. The first book focused exclusively on sweets, but this one looks to be about evenly divided between sweets and savories. It doesn’t just have recipes for special occasion desserts, it has plenty of simple breakfast baked goods and light cafe fare that’s appropriate for everyday. In the headnote to this recipe, Chang mentions that this cake is a personal favorite, even though she isn’t a chocolate fiend. I can see why. 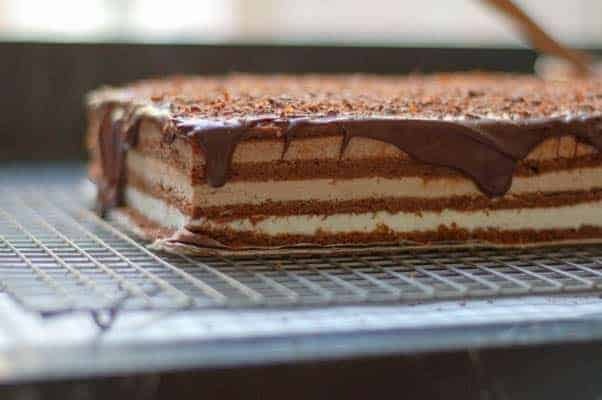 With three layers of mousse, four layers of flourless chocolate souffle cake, all topped with a layer of bittersweet ganache, this cake sounds like it would be unimaginably rich and intensely chocolatey. But this cake is surprisingly, ethereally light. I kind of want to call it a triple chocolate cloud cake. The white, milk, and bittersweet chocolate mousses don’t just look pretty, they also balance each others’ sweetness and bitterness beautifully. It actually makes me wonder why we don’t see more desserts take advantage of this chocolate trio. I mostly followed Chang’s recipe. The one significant change I made was to the white chocolate mousse. She uses a vanilla bean to flavor the mousse, but I opted to swap in fennel seeds, which I think are just fantastic here. I wouldn’t call myself a big white chocolate fan, but I could have eaten a bowl of this white chocolate fennel mousse. Erin remarked that she really liked it too. It’s worth noting that these are more chocolate whipped creams than true mousses, so maybe we shouldn’t be eating them by the bowl full, but each of them–the white chocolate fennel mousse, the milk chocolate coffee mousse, and the bittersweet chocolate mousse–is so good that if you’re not licking the beater after you whip these, I’m pretty sure you’re doing it wrong. It does take three days to make this cake, but most of the work is on the second day. 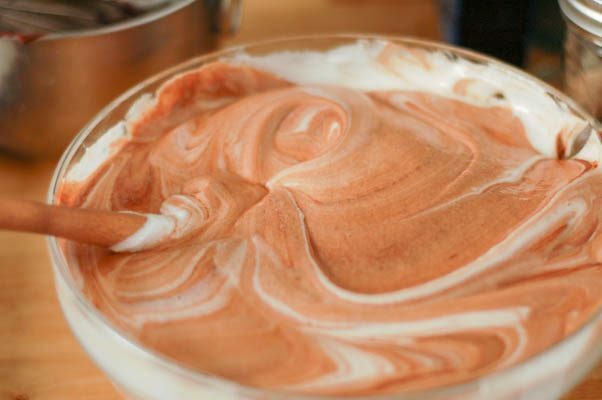 The first day you make the mousse bases, which involves scalding the cream and pouring it over chopped chocolate and then refrigerating it overnight. The second day you make the cake and the soaking syrup, whip the mousses, assemble the cake and put it into the freezer overnight. The third day you trim the cake, and make and top the cake with ganache. It is quite a bit of work, but it’s doable even if you’re not quite as insane as I am. Looking for other absurdly complicated cakes? 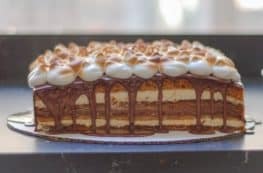 Try this brown butter cranberry curd cake with Biscoff frosting, this strawberry fraisier with Lillet chiffon cake, this passion fruit lime bavarian, or this s’mores cake with toasted marshmallow meringue frosting. Make the three mousse bases. 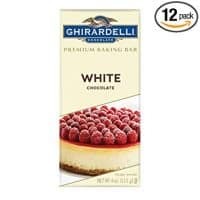 Start with the white chocolate. Heat the cream and fennel seeds in a heavy bottomed medium saucepan. Put the chopped white chocolate in a medium heat proof bowl and have a fine mesh strainer ready. Heat the cream just until bubbles form around the edges. Immediately pour over the white chocolate. Let it stand for about two minutes to melt the chocolate, then stir until the chocolate is thoroughly melted. 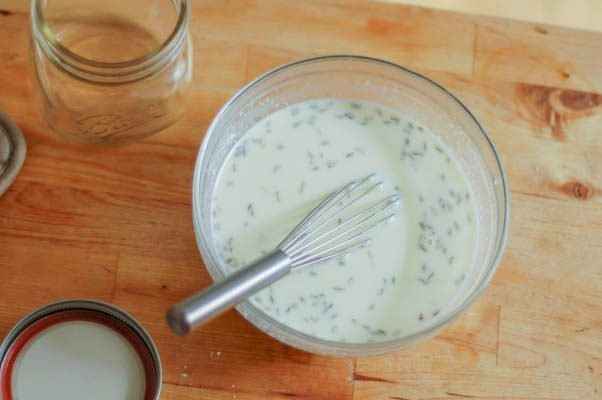 Pour through a fine mesh strainer to remove the fennel seeds, add the salt and transfer the mixture to a small storage container. Repeat with the milk chocolate mousse, heating the cream with the ground coffee (pass it through a strainer, but don’t worry if some of the finer ground coffee slip through). Then repeat with the bittersweet chocolate mousse, heating the cream on its own this time. (No real need to strain this one.) Store in the refrigerator overnight (can be made several days in advance). Make the soaking syrup. Brew 3/4 cup of coffee. Use 1/2 cup hot here and reserve 1/4 cup at room temperature for the cake. Mix 1/2 cup (120 ml) coffee with 6 tablespoons (75 g) of sugar and stir until the sugar is dissolved. Make the cake. Preheat the oven to 350° F and place one rack in the center and one in the top third of the oven. 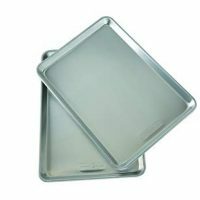 Line two 13″ x 18″ rimmed baking sheets (half sheet pans) with parchment paper and spray with nonstick baking spray (if you’re making this gluten free, don’t use the baking spray that has flour mixed into it). In a large bowl, whisk together the egg yolks, remaining coffee, melted chocolate and salt. 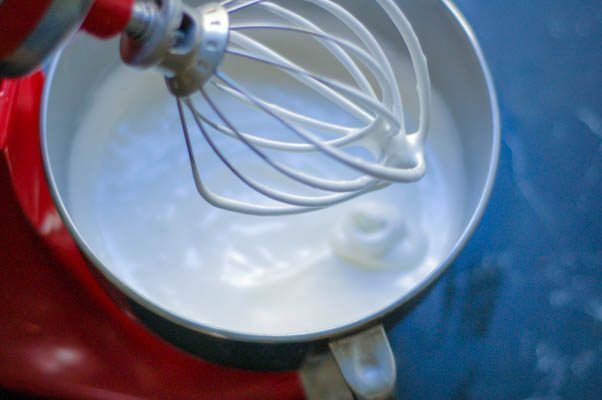 In the bowl of a stand mixer fitted with a whisk attachment, add the egg whites and beat on medium speed for about 2-3 minutes until soft peaks form. The tines of the whisk should leave a trail in the whites and when you lift the head of the mixer the whites should should peak and droop. With the mixer on medium, add the sugar slooowly, about a tablespoon at a time, until it’s all added. This process should take about 2 minutes. Increase the speed to medium-high and beat until the whites are glossy and smooth and hold their peaks. Using a rubber spatula, fold about one-third of the whites into the chocolate-yolk mixture to lighten it. Then gently fold in the rest of the whites until no white streaks remain. Do this carefully. 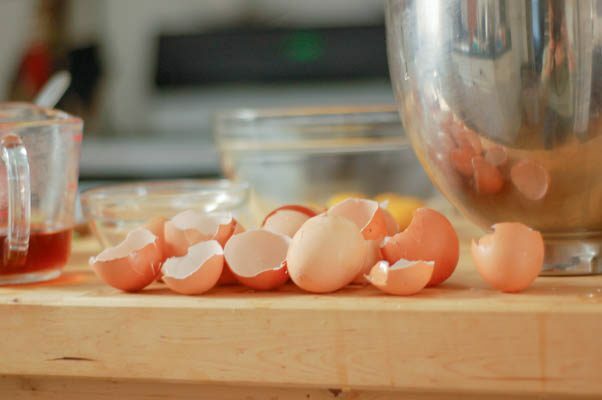 Egg whites are easy to deflate. Divide the batter between the two prepared sheet pans. Starting at the corners, spread the batter evenly over the pan with an offset spatula. It doesn’t need to be perfectly smooth, but you want the corners and edges filled in. The batter should be about a 1/2 inch (1 cm) deep. Bake the cakes, rotating the pans from front to back and switching between the racks about halfway through, about 16-18 minutes. The cakes should look dry on top and when you touch it with a finger, the top should feel dry and delicate and almost shatter and the cake below should feel moist (Chang says the cake top should be “crispy”). Let the cakes cool on wire racks for 10 minutes. At this point you can assemble the cake or wrap the cakes (still in their pans) with plastic wrap and keep at room temperature for one day. Assemble the cake. Run a paring knife around the edge of the pan to release the cake from the sides of the pan. Using a very sharp knife (or kitchen shears) cut each cake in half–from the middle of one long side to the other–cutting through the parchment. 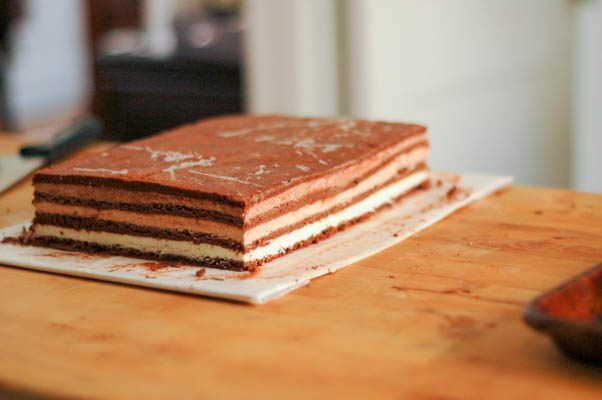 You want to have four layers of cake, each about 8″x12″. Cut a piece of cardboard so it’s slightly larger than the cake (you don’t need much overhang here–I probably had too much in the photos above). Take one cake layer with the parchment attached and carefully flip it over onto the cardboard and remove the parchment. If the cake breaks anywhere, don’t worry, just patch it together as best you can and keep going. In the bowl of stand mixer fitted with a whisk attachment, add the white chocolate fennel mousse and whip until it holds stiff peaks. Spread the mousse evenly over the cake layer with an offset spatula. You want an even layer, but you don’t need to worry about some of it spilling over the sides because you’ll trim the edges later. Clean and dry the mixing bowl and the whisk attachment. Take another cake layer with the parchment and carefully flip it over onto the white chocolate mousse and remove the parchment. 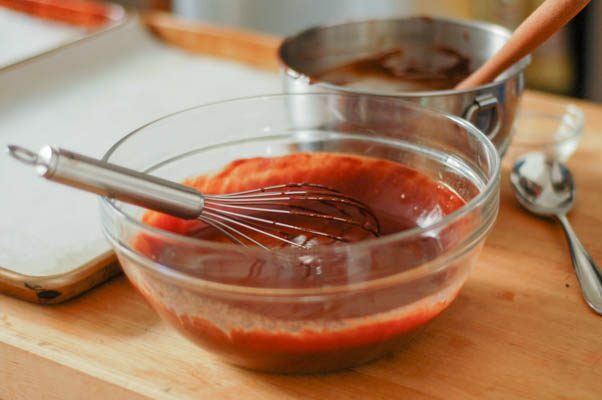 Using a pastry brush, spread about a third of the soaking syrup over the cake layer. Whip the milk chocolate mousse until it holds stiff peaks. Spread it in an even layer over the cake. Again, clean and dry the mixing bowl and whisk attachment. 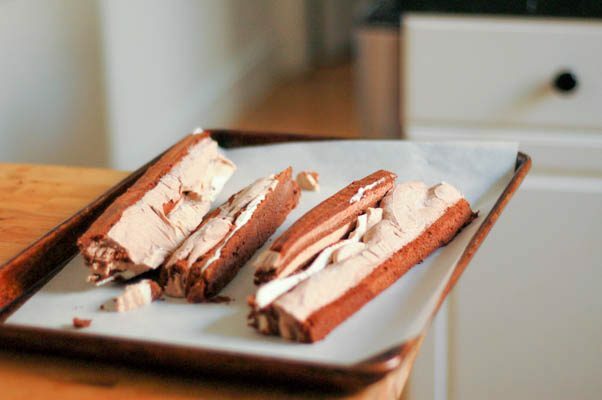 Take another cake layer with parchment, flip it over onto the milk chocolate mousse, and remove the parchment. Brush about half of the remaining soaking syrup onto this cake layer. Whip the bittersweet chocolate mousse until it holds stiff peaks. Spread it in an even layer over the cake. 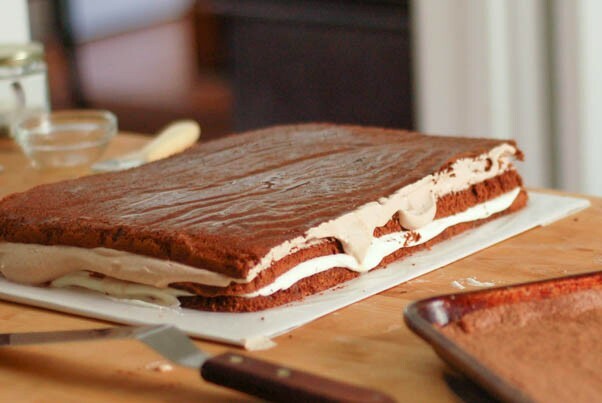 Take the last cake layer with parchment and carefully flip it over onto the bittersweet chocolate mousse. Brush with the remaining soaking syrup. At this point, make sure that you have an even landing spot for the cake in the freezer. Wrap the cake gently with plastic wrap and put it in the freezer overnight. Depending on how stiff your cardboard is, you might want to place a sheet pan underneath it to make this easier and to keep the cake even. 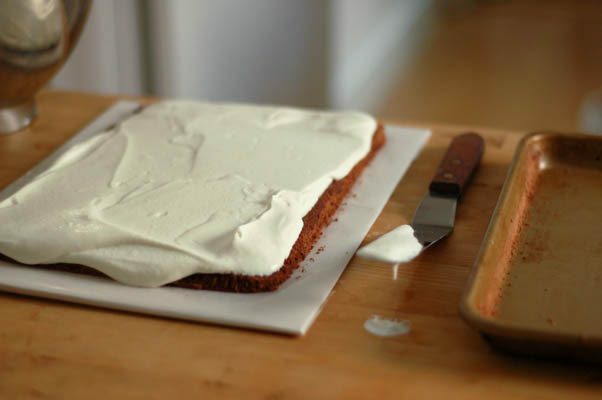 Remove the cake from the freezer and place on a cutting board. 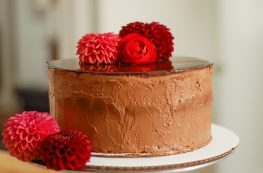 Using a sharp chefs knife dipped in hot water trim about a 1/2 inch (1 cm) from each side of the cake, dipping and wiping the knife clean between cuts, to expose the even layers of mousse. (You can snack on these trimmings later–they’re best after they thaw.) Trim the cardboard base so it is flush with the cake and set on a wire rack set over wax paper. Make the ganache. 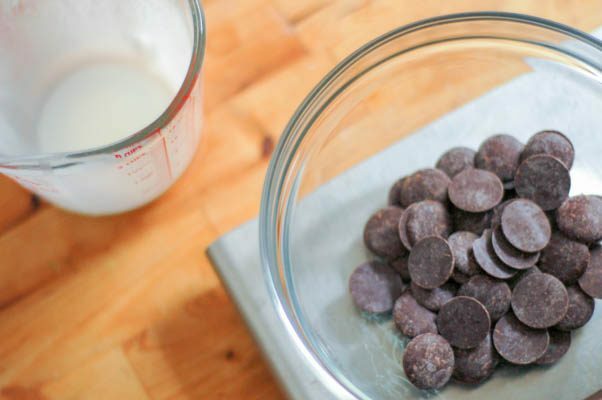 Place the chopped chocolate in a small heatproof bowl. With this small amount of cream, it helps to partially melt the chocolate before you add the cream. You can heat it in 15 second bursts in the microwave or heat it over a double boiler until it’s about half melted. 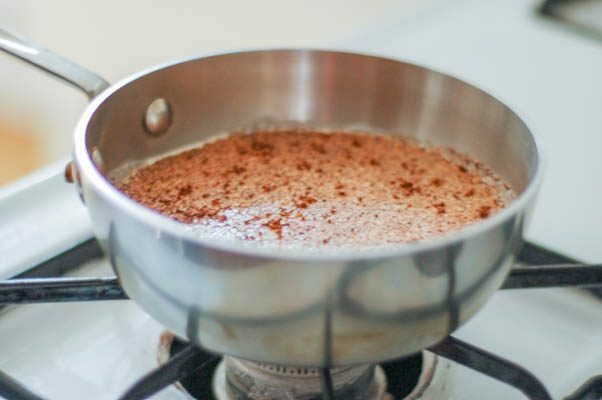 Heat the cream in a small saucepan until bubble form around the edges. Pour over the chocolate and let sit for about 30 seconds. Starting in the center and working out to the edges of the bowl, slowly whisk the chocolate and cream together until the chocolate is fully melted and the mixture is uniform and smooth. Pour the ganache over the cake and quickly spread in an even layer with an offset spatula, letting the excess drip down the sides of the cake. The sides should remain mostly exposed to show off the mousse layers. At this point, you can top with chocolate shavings or just leave the ganache as is. Store in the refrigerator until you’re ready to serve it. Totally worth it is right! This was so delicious. Thanks, Manal! It’s one of the best cakes I’ve ever made. This is a beautiful cake. Love all the layers. A lot of work but worth it. Thanks, Peter! It’s a special cake. I love this! An awesome celebration of all things chocolate, and those layers are so elegant. Pinning this for later! Thanks, Rachel! I love this cake. Thanks! I always feel like a picture conveys so much about the process of a project like this. This reminds me of my wedding cake … as she squeals with delight! I’m bookmarking the recipe to make for a special occasion – our anniversary next summer. Although if I keep looking at these photos, I may be making it sooner. Thanks, Linda! This is totally worthy of a special occasion! What a wonderful idea to add fennel seeds to the white chocolate mousse. Sounds lovely, and this looks like a beautiful cake! Thanks, Amanda! I love that combination. It’s one of my favorite cakes ever. Thanks, Adriana! It’s so worth the effort. Thanks, Wajeeha! I think the flavor combinations here really work. Thanks, Sara! I won’t lie and tell you this is easy, BUT it is totally manageable if you break it down into separate parts. I always feel that visuals really help me when I’m entering into unknown baking territory. Hmm…I’m not sure what happened. My best guess is that everything got a little too cold (if your kitchen is cold, like mine is these days, that seems possible). You could warm it gently–set the bowl on a heating pad or in a pan of hot water and give it a stir until everything loosens up. 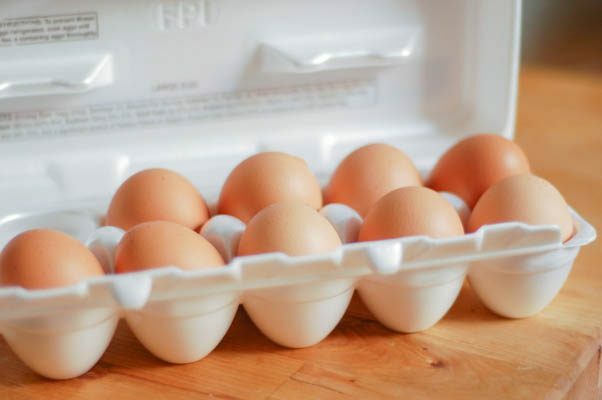 If you are working in a cold kitchen, it’s a good idea to bring the eggs up to room temperature for a recipe like this so they aren’t refrigerator-cold. You can set them in a bowl of warm water for about 10 minutes to speed up that process. Can the cake be frozen for a few days? Yes, absolutely, but I’d give it an extra layer of plastic wrap for extra protection. Just be sure to do the final steps (trimming the edges and covering with ganache) within 24 hours of serving it.